The Office of Sponsored Programs at USD partners with faculty, administrators, and graduate students to provide a variety of pre-award services for externally-funded projects. These services include concept development and identification of potential extramural funding sources, proposal and budget preparation, and the submission of innovative, high-quality, competitive proposals. Our team is committed to providing quality service and support to the university community. 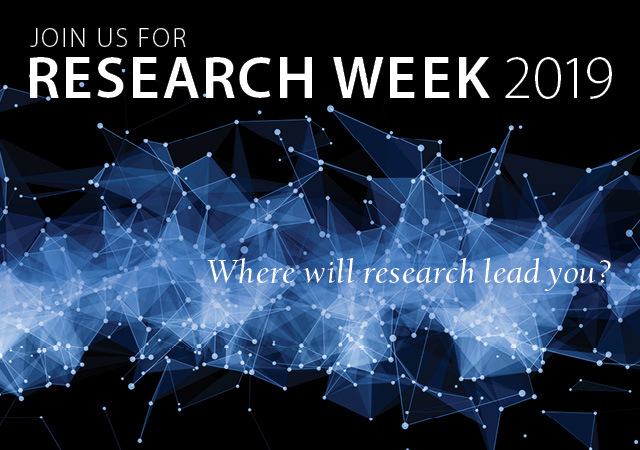 Please join us for Research Week—a celebration of the many research activities at USD. This multi-faceted showcase will focus on the importance of research at the university, and will include various events, open houses and demonstrations. Research Week is free and open to the public, so please join us! By teaching we learn. Through research we grow. Jump into Research Week by joining this folding and mathematical exploration journey to discover something beautiful! The event will conclude with a campus-wide mathematics scavenger hunt. 2) to foster intercollegiate interactions among students and faculty who share a commitment to undergraduate research in the biological sciences. Meet the 2018-19 Keck Humanities Fellows as they discuss their experience working on a year-long, independent research project. They will share their insights into the fellowship, engaging with scholarly interdisciplinary research, and working in collaboration with their faculty mentors. Following the panel discussion will be a Q&A session along with information about how to apply for the 2019-20 Keck Humanities Undergraduate Research Fellowship. Join the Vice President and Provost and the Office of Sponsored Programs for a wine and cheese reception honoring faculty members and staff who have submitted grant proposals. This event is by invitation only. The Outstanding Undergraduate Research Mentor Award (OURMA) Mixer recognizes research mentors who bring respect and excellence to the practice of mentoring undergraduates in research and scholarly activities, and who have a long-standing commitment to the development of research scholars. Student-faculty research and collaborations featured in poster format. In spring 2018, the Humanities Center began a major and ambitious exploration of the three underlying concepts that constituted the foundation of USD at its inception: beauty, goodness and truth. In the words of Mother Rosalie Hill, “Beauty will attract them, goodness will lead them, but the truth will hold them.” Having examined the concepts of both beauty and goodness, we complete the series with an investigation into the idea of truth, approached from a range of perspectives and disciplines. Each session consists of three presentations by experts drawn from USD’s College of Arts and Sciences. At a time when the very idea of truth appears to be under attack, this semester long investigation takes on topical and urgent significance. Please join University of San Diego TRiO students and staff who are affiliated with McNair Scholars, Student Support Services and Upward Bound in a research crawl. We begin in the Shiley Center for Science and Technology, swing through the Shiley-Marcos Engineering Building and end with a debrief (with snacks) in Student Support Services (UC 113). Along the way we will enjoy intriguing and insightful lab presentations and poster presentations from our TRiO students, and recognizing valuable partners. Join an interactive poster session and panel addressing such topics as diversity, inequality, multiculturalism, inclusion, and historically underserved populations. We hope to create an opportunity for faculty, staff and students to discuss issues of diversity and social justice in the contexts of education, counseling and family therapy, and leadership. Come experience the potential of virtual reality to empower your research. The 29th Creative Collaborations Undergraduate Research Conference will feature multidisciplinary presentations of student-faculty research, scholarship and creative works. CCURC29 will be held in the Hahn University Center, Student Life Pavilion Exhibit Hall and La Gran Terraza patio. The USD Military and Veterans Center is recognized as one of the best in the nation for the support provided to our military population. The program uses a student-focused approach to work with all military-connected students from initial consideration through alumni status. Congratulate Dr. Moriarty on his accomplished career at USD, and network with current students and faculty in the department. The Psychological Sciences Department is excited to showcase all the recent changes in the department, and hear what their alumni have been doing since graduation! The lab crawl is an opportunity for the USD community to learn about student-faculty research in STEAM while visiting laboratories in Camino, Loma and Serra Halls, and in the Shiley Center for Science and Technology. Participants collect stickers at each lab station to redeem for free pizza and raffle prizes. The department of Psychological Sciences will display posters of research done by our Behavioral Neuroscience majors, and students will provide a brief, 3-5 minute overview of their work. There will be plenty of time for informal questions and answers, and discussion of research opportunities within the department.